Jumana Islands in Dubai ... shores protected with Alyaf geotextiles. Saudi Arabia’s Alyaf Industrial Company has witnessed a surge in demand for its distinguished range of geosynthetic products in high-profile projects across the Middle Eastern market, particularly in Dubai and the rest of the UAE. “Alyaf has stamped its imprint all over the Emirates, with a variety of prestigious projects in marine applications including the Jebel Ali Terminal, beaches and marine walls for Al Seef Island and the Business Bay Canal with Dubai Municipality,” says Khalid Meccai, technical support manager. “Alyaf’s superior products, along with its unrivalled technical expertise, are key differentiators that have helped the company become a preferred choice for project owners, consultants and contractors in the UAE,” he adds. 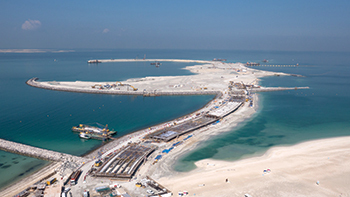 Recently, Alyaf worked with Van Oord and its design consultant Sogreah to provide a system for shore protection at Dubai’s Jumana Islands One and Two project. The man-made islands are being developed by Meraas Holding as a mixed-use development including a boutique resort, luxury residences and a marina. In consideration of the application requirements, Alyaf has supplied more than 200,000 sq m of its high-end range of needle-punched nonwoven geotextiles to provide sustainable coastal protection. Alyaf’s engineered XP Range was also the product of choice at another recent project off the Jumeirah Beach coastline – the multi-billion-dollar Bluewater Island project, where Alyaf XP110 was utilised to protect the shoreline of this high-end project. Some of its other key recent projects in the region include the road and area improvement works at Deira Wharfage Development project in Dubai; the construction of wastewater works of developments in Abu Dhabi, UAE; roads and infrastructure in Doha Industrial Area, Qatar; Ras Al Khair Port and the Jeddah landfill in Saudi Arabia; and the breakwater at the Al Faw Grand Port in Iraq. Alyaf offers a comprehensive range of high-quality geosynthetic products including geotextiles in polyester and polypropylene, geocomposites, geogrids, cellular confinement systems and geosynthetic clay liners (GCL) for a wide range of civil and environmental engineering applications. Complementing Alyaf’s superior products is a dedicated professional technical support team of qualified engineers backed by more than 20 years of hands-on experience in the Middle East in varied geotechnical applications, including road and site improvement, marine construction, bespoke drainage applications, capillary break layers, salt barriers, roofing systems including specialised garden roof systems, landscaping, landfills and landscaping. Alyaf has become the first geosynthetic manufacturer in the region to achieve the Integrated Management System (IMS) certification encompassing the ISO 9001:2008 quality management system, the ISO 14001:2004 environmental management system, and Ohsas 18001:20007 occupational health and safety system, for its compliance to international standards in quality assurance, environment protection and occupational health and safety. The company has recently inaugurated its fourth production line in Dammam, Saudi Arabia, for the exclusive manufacture of its latest Alyafgeo composite range of products. The new product range, developed specifically for the Gulf, has received immediate acceptance from clients, consultants and contractors in the region.